Mosquitoes have long occupied the lands of the Bishop Paiute Reservation. When the reservation established in the 1930s, it was a wetter place than it is today. Many miles of underground drainage were required to dry the land to make it suitable for agriculture and housing. Historically, the Tribe has been largely reliant on the adjacent County of Inyo to perform mosquito control. Fogging was a regular practice to exterminate adult mosquitoes. Presently, wetlands located near the exterior boundary of the reservation breed mosquitoes that cause a concern on and off the reservation. Water from unmaintained ditches creates diversions that feed off-reservation parcels and generate another category of mosquito habitat. Recent budget considerations in the State of California have stretched county assistance thin. Inyo County Mosquito Abatement Program personnel have maintained communication, providing the Tribe with technical assistance so the Tribe can monitor and treat their own areas. 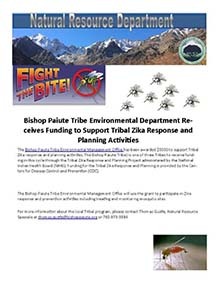 Collaborations: The Bishop Paiute EMO Department has been working with the Inyo County Agriculture Commission to help control mosquito issues on the reservation. Treatments: We treat the mosquito with a larva pesticide called VectoBac that only the mosquito larva and black flies will eat. Click here to read more about VectoBac. Mosquito Monitoring: We check sub waters and irrigated fields and determine the best strategies to prevent mosquito breeding grounds. Click here to access the Mosquito and Vector Control Association of California. 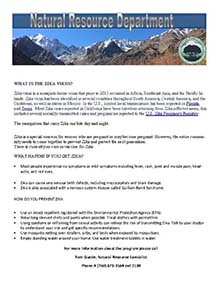 Click here to view the Owens Valley Mosquito Abatement Program. Click here to view Zika Virus information provided by National Indian Health Board.